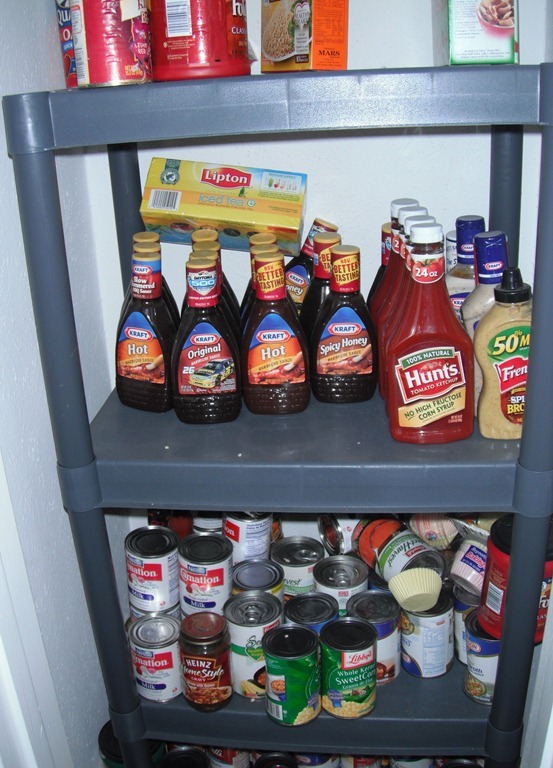 Let’s Get Organized: Small Stockpile Pantry Storage! 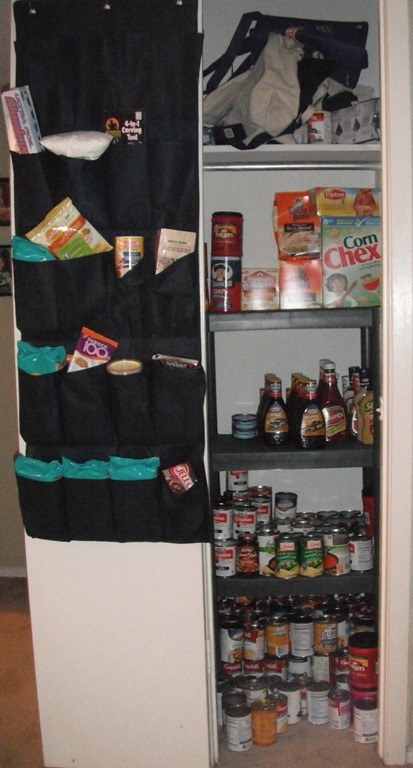 You are here: Home / Great Deals / Let’s Get Organized: Small Stockpile Pantry Storage! When we moved in I knew where I was going to house my stockpile pantry – what I didn’t know was how! and no, it’s no bigger inside than it looks! So, the challenge was to go from a large full sized closet with wide shelving to this! Well, the first thing I did was look for shelves that would fit, luckily Walmart had 1 set in stock. They were plastic and $16 – they fit the bill! In fact, they look as though they were specifically made for it! What a mess! It was stuffed to the brim before Christmas – I sent much of it to the shelter. Now, just so that you know – I know there has been much talk of over-doing the stockpiling. I have 3 grown children – 2 of which are single boys (men…) and their friends who have all begun to move out on their own – none are married yet, so yes I spoil them. They “shop” in my closets! They come over and grab a plastic grocery sack and begin in the above closet and move to the health and beauty aids closet! I enjoy being able to give to them and they appreciate it, too! So, all of what you see isn’t just for us. Plus, as you all know I give to the shelter all year as well. I encourage you all to share what you have. Tamona of Tamona’s Tips says she doesn’t have animals but her neighbors do, she makes up gift baskets for them with all the FREE animal products she gets! I always buy FREE no matter what! I don’t have a cat, but, if the cat food were FREE would I buy it? You bet! Then I would give it to a friend or neighbor or an animal shelter (if they would take it). I definitely need more room than just the shelves – so I found hanging shoe bags for $6 at Family Dollar! So, for the shelves and the shoe bag I spent $22 to outfit this “pantry”! Not bad! 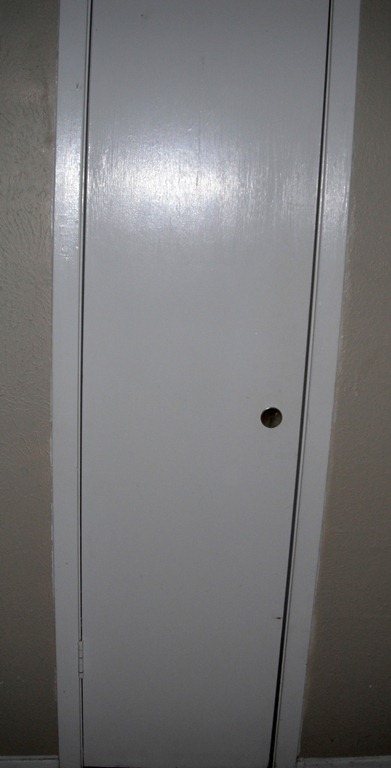 These pockets are deep so I can stack things in them, too, there are like 18 pockets or 24 – that’s a lot of storage! We try to make sure when we unload the groceries to put the things that expire last in the back and keep the things closer to expiration up in the front. We also try to keep the like things together – cans with cans, boxes with boxes and so forth. So, how in the WORLD do y’all remember to use them? I love, love, love my reusable bags. They’re so fabulous, tough, and makes carrying in the groceries a breeze. The way I remember mine is to put them on top of my stove the night before grocery shopping, along with my list, packet of coupons, and the diaper bag stocked and ready to go. All it took for me was forgetting them one time after having consistently used them for a few weeks and getting… wait for it….20 plastic bags. Where I usually fill up 6 canvas bags. Yeah. And then had one bust and had to chase a can of beans down the driveway. Good luck with remembering! Enjoying your site! I remember my CVS bags all the time because I attach the green tags to them. Every 4th time they get scanned I get $1 ECB! If only the other stores would do this…lol:) I wish they made a clapper or something to remind me for the other stores. @Laurie: I forget my CVS bag tag too! Lol. I have it attached to my purse and the cashiers always point to it! So sad! Lol! I NEVER use plastic anymore as I have gotten ALL my bags for free!! I have 1 bag that keeps my coupon binder and lists when I go shopping. I place them on the belt BEFORE any groceries. @Marianne Handlir: Oh That’s a great Idea! Put my binder in a bog and the others in there too then on the belt first! Love it! Marge Nelson » You have to contact your paper and ask them. My paper won’t even let me buy more than 1 subscription. So, it would depend on your newspaper! Good luck and let me know if you have any more questions!